One of the perks of working in media is the free tickets to events. This weekend I had a double pass to the Melbourne Antiques Show, so dropped in with a friend. There was, as expected, a lot of covetable furniture and other bits and pieces, including what can only be described as a geisha’s toolkit (a set of .. um.. adult toys.. made out of buffalo horn.. and an innocent looking portrait that revealed.. er.. instructional diagrams when part of it was removed… yes, I should have taken photos!! Maybe you can go to Kazari and find them yourself, if you’re interested). 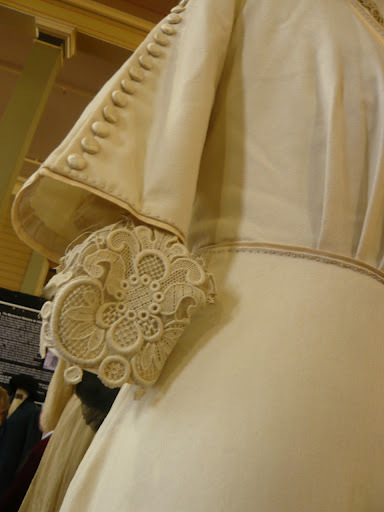 Anyway, I was also pleased to discover part of the Titanic exhibition that has been touring with The Way We Wear fairs. I’d missed out on those last year so it was a nice surprise to see it here. 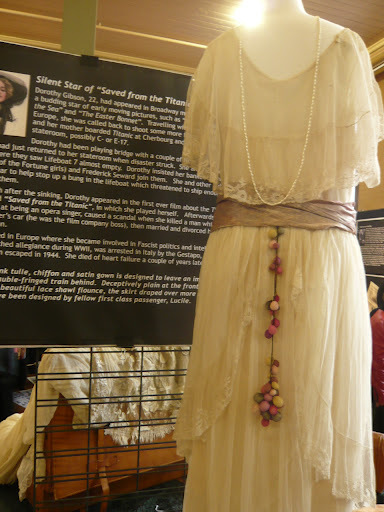 The exhibition is the result of two years of work by Fiona Baverstock of Seams Old which deals in vintage and antique fashion and accessories and also had a stall at the Antiques Show. 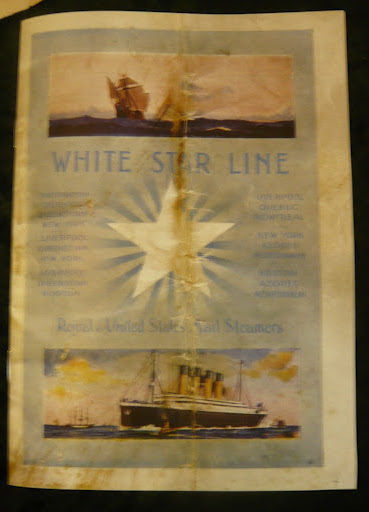 Fiona told me she is also a historian and that a lot that has been published about the Titanic is simply not true, but she has done her best to sift through the newspaper reports and other documents of the time to build up accurate profiles of some of the passengers travelling on the Titanic. 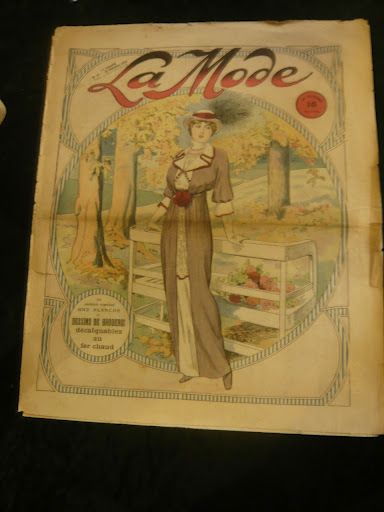 She has then found the kind of clothes they might have worn (from within her ample stock!) to accompany the very evocative description of each passenger. I’d never heard of the little “Titanic orphans” that were, happily, reunited with their mother after their picture was published in newspapers around the world. This is how they might have dressed. 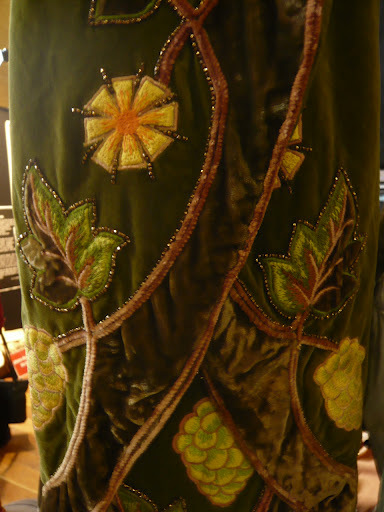 … and a matching scarf with a close-up of the trim. Terrible shot of this dress, sorry! 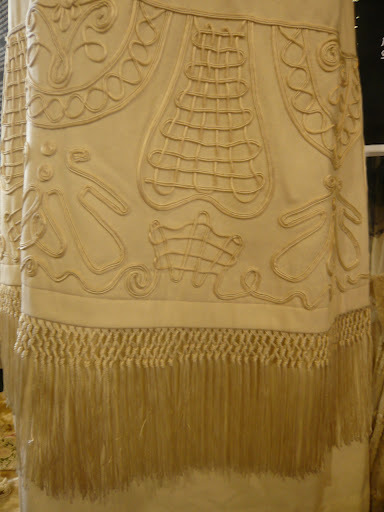 … and on the skirt section – FRINGING! 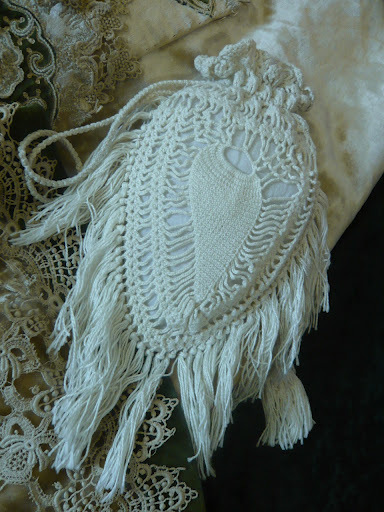 Here’s a little reticule the lady might have carried when wearing the dress. This is a maternity dress for a very wealthy lady. A far cry from the leggings and baggy tops that mums-to-be get around in today! 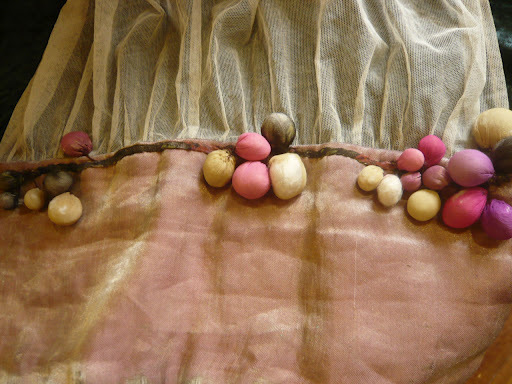 I don’t think she could have worn this after the baby was born – imagine trying to get milky dribble out of the beadwork and velvet! 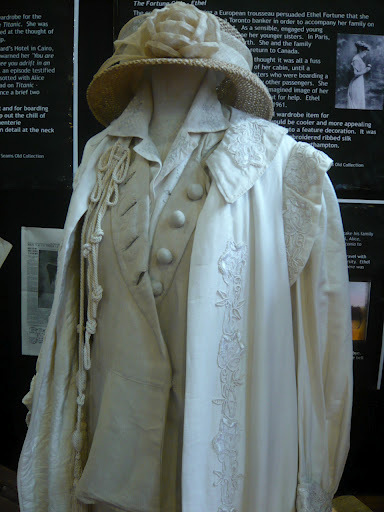 Two more travelling outfits – looks like cream was the colour of choice for seafaring ladies at the time. Classy use of textures and embellishment instead of printed patterns, yes? 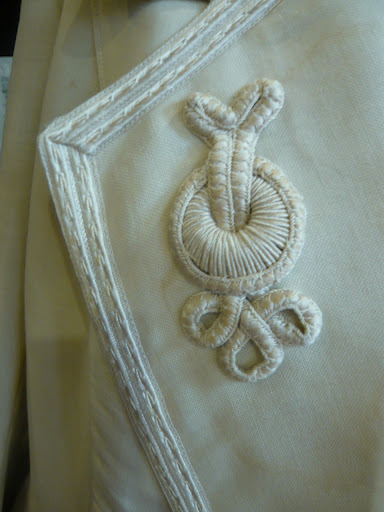 Here’s a close-up of the lapel decoration. 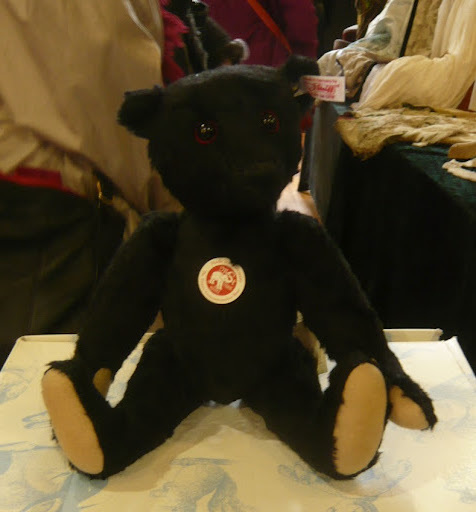 Steiff released limited edition “mourning bears” in black when the Titanic went down. The originals are now worth a small fortune, but this one is from a new release… which will also no doubt be worth a small fortune in the years to come! 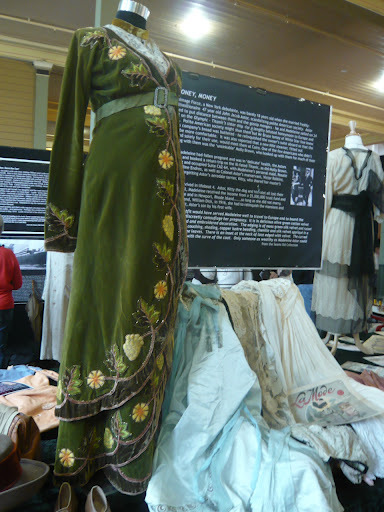 Fiona told me that the exhibition has cost her a lot to put together and she is looking for a museum interested in buying it or funding its future travels. So I’m not sure if you’ll be able to catch it any time soon. However, Fiona did say it would be probably showing in Darling Harbour (Sydney) next, so keep your eyes peeled – or go to the Melbourne Antiques Show TODAY!! What a fantastic exhibition! 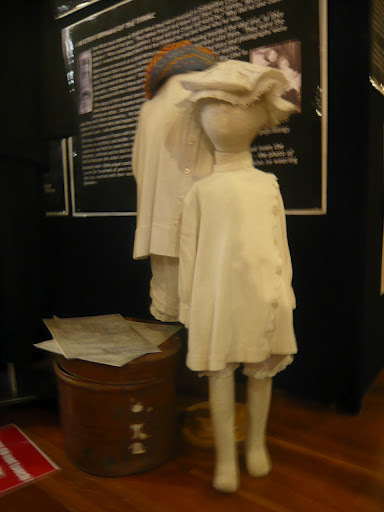 I've been to one or two Titanic exhibitions before, but none with a slant towards what the passengers would have been wearing. It's a great idea and such a lot of work has obviously been put into it. 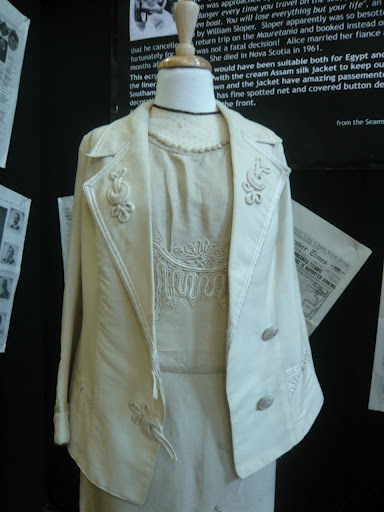 I hope Fiona receives interest from a museum soon so more people can view her exhibition.